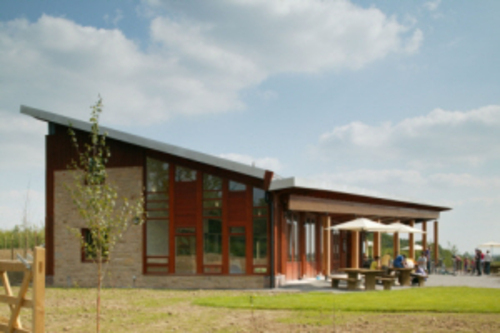 We are pleased to announce that the Hicks Lodge Cycle Centre project completed by Robert Woodhead for the Forestry Commission achieved second place in this years EMCBE (East Midlands Centre for Constructing the Built Environment) Environmental Sustainability Award category. Incorporating Woodhead’s knowledge of green technologies, Hicks Lodge utilises sustainable timber throughout, solar panels, a biomass boiler, a sustainable urban drainage (SUD) system in an airtight structure, all design elements which make a significant contribution to sustainable development principles. Set in the National Forest the project is designed to BREEAM Excellent standard. Only one site skip was used with less than 3% of waste going to landfill. When it comes to choosing a reliable construction company, you can be assured that Robert Woodhead Ltd is here to stay. Established 1946 and incorporated in 1978 we have grown steadily. With over 60 employees and an ongoing portfolio of projects, we are the partner of choice for anyone looking for a successful and proven construction partner. This press release was distributed by ResponseSource Press Release Wire on behalf of Key Principles in the following categories: Environment & Nature, Construction & Property, for more information visit https://pressreleasewire.responsesource.com/about.